Calling all AVID students! Join us for a tailgate before the BOHS football game on October 5th at 5:30 pm! Click above on the "AVID Tailgate" link to get all the details! 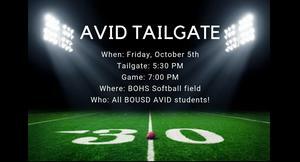 Join Brea OLinda High School, Brea Junior High & Arovista AVID Families for an AVID Tailgate party @ 5:30pm before our BOHS Football game @ 7pm! Please RSVP to your AVID teacher by Friday, Sept. 14th to receive your Tailgate ticket. AVID students will be treated to Tailgate Food and A game ticket. 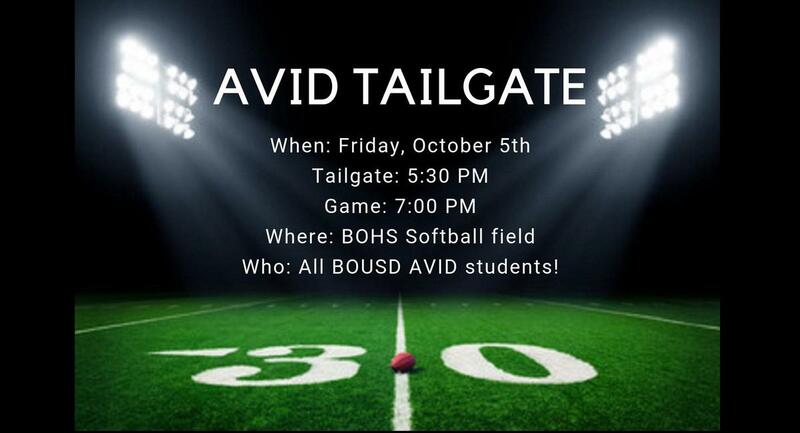 ALL AVID STUDENTS should wear their Brea Olinda Unified AVID T-shirt to the tailgate. Parents attending with their AVID child will need to purchase a ticket to the football game.